I spent a relaxing day with my Aunt Diane around her home town of Tucson. We started the morning in Sabino Canyon, a lovely place to hike. 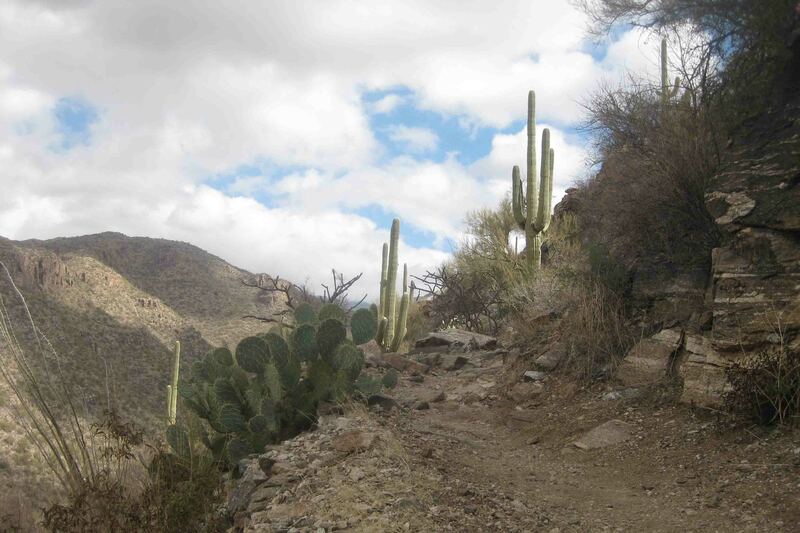 Countless trails crisscrossed the mountains covered in cacti. We walked up the road a few miles and then took a switchback path up the mountain to Telephone Line Trail. The views of the cactus line (instead of the tree line) were unique as well as gorgeous. As we ventured back down to the road, we met a couple that planned to walk the entire Telephone Line Trail and then take the tram back to the parking lot. “Well then, the tram won’t pick you up”, Diane warned. I imagine they were thankful to know that because despite the clouds it was relatively hot and unusually humid for the desert. They would have been facing at least an eight mile walk. Petey wasn’t allowed on the trails so he stayed in VANilla parked in the shade of the only tree with the screened windows open, a fan blowing, and the shades drawn. Cool digs and dog-proofed, or so I thought. I left Petey with a chewy and I wedged my plastic bins of dried food which were clipped shut and reinforced with a bungy cord under the bed. My soft-topped cooler was zipped closed, and almost all my food was stored in the locked refrigerator. Pesky Petey, however, not pleased with the arrangement, went to work. Petey partially opened the storage area in the top to my cooler. Then he chewed hole through the lower layer of the storage area large enough to retrieve a package of tortillas. He ate every last one of them. Really?!? I wish I had a video camera mounted in VANilla. Petey would be the winner of America’s Funniest Home videos, and I’d be $10,000 richer. He showed me! After our morning hike, we stopped by Uncle Mike’s pottery showroom in Tucson. He sells a variety of pots, fountains, and figurines for indoor and outdoor gardens. Mike imports factory direct thus he has a large selection available at affordable prices. Petey is a WIZARD! You definitely need to keep a journal of his escapades. He is too funny. Diane took me to Sabino Canyon a year or so ago. It’s very pretty. I’m glad you got to go. Love your photo of Mike!